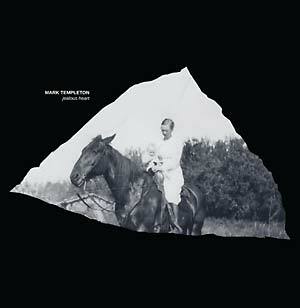 Mark Templeton presents Jealous Heart, an album which re-imagines the story of his sound in an approach that is both staid and deeply emotional, reorienting what is offered and what is held back through a myriad of smeared stringed instruments, fragmented horn phrases, tape loops, and found-sound-driven explorations. Templeton's music is always difficult to truly classify, which is part of its charm. It is way too dense and detailed to qualify as ambient in a traditional sense -- instead developing itself into a highly organized, spacious clutter. It is electro-acoustic music that harkens to tape machines and misused instruments of yesteryear, viewed whole-heartedly through the prism of ultramodernity, of an awareness of what has transpired in-between. Filled with subtly processed horns that recall a jazz club under the sea, a speakeasy of a future past blanketed in a detailed haze that allows one to find an individual path through it -- a precise murkiness, where objects coalesce in the background while the focus stays predominantly on the instrumental underpinnings of each track. At times the album holds a sense of longing, of days past or imagined to be, but cloaked in hopefulness, of a consistent sense of working through an idea, an experience, a sound source -- wringing something constructive out of it and re-forming it into something better. Warm and textured is a given with Templeton's work. This album is similarly so, but with a layer of knowingness, an awareness that warmth is not enough. There is a pervasive sense of age, a feeling of it being an older object than it actually is, almost as if it was found on a forgotten shelf, yet had sensibilities that won't exist until tomorrow. The landscape becomes one where the album manages to be constantly moving while presenting the listener with a sense of stillness, a balancing act that is incredibly difficult to get right.